Eric DelaBarre is the author of Saltwater Taffy, an award winning filmmaker, speaker, and ghostwriter for Random House/Harmony Books. Eric began his career with Universal Studios on NBC’s mega-hit drama, Law & Order. His work has been sold around the world and showcased on HBO, Cinemax, Showtime, Starz/Encore, USA Networks, and NBC. He is past president of the Boys & Girls Club Council of Santa Monica and travels the country talking to kids about literacy and their potential in life. After years of creating content that centered on crime, Eric is now dedicated to stories of adventure for children! He lives and works in Santa Monica, California with his wife, Julie and their baby girl! 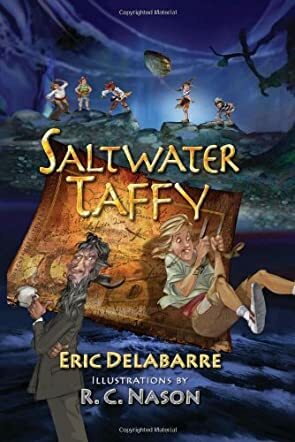 "Saltwater Taffy" by Eric Delabarre is one of the best children's books I've read in years! The story about the antics and the growth of five friends in the Pacific Northwest involves a search for the long-lost treasure of pirate Jean Lafitte. Pieces of a puzzle are gradually leaked and those that can decipher the codes have access to the treasure. The only problem is the gang of friends has an adversary in the name of Old Man Sheesley, a strange and lonely man who gives profound advice but appears bent on undermining the efforts of the gang so that he can claim the treasure for himself. Along the pathway to the buried treasure, the group of friends find themselves threatened by a bear, a cave disaster and a rival baseball team who considers the members of the gang a bunch of unskilled losers. As Scott, Zippy, Jaq, Gary and Jimmy seek to find a treasure which will make them rich and famous. They also discover friendship, loyalty and the importance of believing in oneself. Delabarre has so many wonderful messages contained in the ongoing adventures in this book. It is delightful for the reader to be using his or her imagination to try to solve clues to a puzzle while, at the same time, learning about the important things in life. The children are all adorable, with each facing his or her own teenage demons in the form of doubts, anger and lack of self-esteem. No matter how old you are, this story will both touch your heart and provide a refresher course on the various messages of life's journey. I love how the author takes the innocence of youth and makes it fun and entertaing!! My son and I both loved reading the adventure of Saltwater Taffy! I love the book Saltwater Taffy. It is one of the best books I have ever read. Really wonderful story - sparks the imagination and delivers with every page! Son loved it. He loved it so much it was on his birthday list. Fun book. An adventure the child in me longed to experience! Amazing book!!!!! Loved reading it!!!! Saltwater Taffy is my new favorite book!!! It came alive right in front of me! Love Eric's writing!!!! This is such a great story for kids and very well written. We loved it! "One more chapter, Mom....please!" This book, while amazing and so much fun to read with my two boys, can slowly make your child's bedtime get later and later because they want to hear more and more of the story. Great book! My 10yo daughter and I team read SWT and loved every page! If you have tween's, you owe it to them to get this book. They will love it too! Can't wait for the movie! Saltwater Taffy is a definite pick for me. I wish I'd had more books like this when I was in school! Fantastic book! Excellent read-a-loud too for younger or reluctant readers. What a great read. I wish I would have had this when I was a "tween"!!!! Wish I had this when I was younger and glad I have it now. Totally awesome adventure AND it shares amazing wisdom for creating a life that is LIFE_GIVING. Everyone ought to read this book. A page tuner for parents and kids! This is such a fun adventure - its a book we will read again and again, from generation to generation. Buy it now, gift it, it's a treasure for sure! Super fun and exciting book. Reminds me of when I was a kid in the late 60's, and dreaming of adventure. If you don't love this book, then you don't love modern literature surely to become a classic!! Excellent! Adventurous an thought provoking. Highly recommended! A wonderful, inspiring book for "kids" of all ages - even the grown ones. My daughter couldn't put down Saltwater Taffy, so I jumped in on the reading and I have to say, I enjoyed the adventure. We sell this book at our ice cream shop, Elevated Ice Cream Co. in Port Townsend, WA. I have heard from so many parents, grandparents and kids about how much this book means to the "tween's" in the family. It is fun, lively, and filled with meaningful themes of self confidence, friendship and how to look beyond the superficial in life. Julie McCulloch, Elevated Ice Cream Co. I am a huge fan of the book and author! Great book to read together with your kids! Ageless and timeless. Saltwater Taffy is such a fun book to read. For so many of us that felt like outsiders who weren't accepted by the "cool kids" growing up, Eric's book helps teach us that being the cool kid for a couple of years in junior high doesn't really matter in the grand scheme of life. "Saltwater Taffy" helps us recognize that understanding one's self, striving to be your own best, accepting who you are and embracing those things that are unique to you while recognizing what matters in life: showing genuine love, care and concern for others are really what is most important in life. That, of course, combined with a great sense of humor and a recognition that reality includes some good natured (and some not so good natured) teasing. Like an innovative mother who manages to get their children to eat their vegetables by hiding them creatively in to a well liked dinner dish, DelaBarre creatively embeds the important messages and lessons to be learned throughout his story. These "treasure tips" may be found at the end of the chapters, a more blatant approach for some readers who may not yet posess the literary skill set to read between the lines. In doing so, he firmly drives home the message that "not yet" doesn't mean not ever. Further, even if that child never excels in the literary arena, he reinforces that each of us has something unique to offer. Whatever that gift might be, he encourages the readere to accept that talent and be grateful for their individuality. Written for the "tween" age group of approximately eight to thirteen, DelaBarre's book is a must read not just for the adventure and the story, which will remind so many of us of "The Goonies" meets "Stand by Me," but because the characters are not the only ones who learn something valuable along the way. I loved reading this book to my kids (ages 4 and 7). It has characters that kids relate to and a storyline that stresses accomplishments and ingenuity. The clues and mystery solving aspects of the story made my kids want to hear more and more each night. I read this book with my twin sons (age 7) and we all agreed....this would be a great movie. I love how the author teaches great life lessons throughout the story. Every parent of a TWEEN should pick up Saltwater Taffy. Really awesome. My kids loved this book! After we read it aloud they had to share it with their teachers at school too. It was such a fun and creative story. Saltwater Taffy is my favorite book this year and that's saying something cause I read tons. My sister and I have now read it twice, once under the blankets, and I can't wait until they make the movie! I read this book to my boys this past 4th of July and thought it was great. My sons didn't like that we started out reading a chapter a night. They kept asking for more as each chapter was a cliff hanger. Finished the book before Sunday bedtime. What a great book!!! Love the adventure that takes place in it. Wish I could be transported back in time to go on an adventure with those kids. I have two daughters and we all have read it. We have given the book to most of their friends and they love it. It is a book that you don't want to put down because you want see what is around the corner for this group of daring kids!!! Enjoyed thoroughly!!! My sister got this book for her birthday and I stole it from her because she is reading two books right now and I really liked it. Im taking it to summer camp and will read it again cause it is cool. Camp KC read SALTWATER TAFFY this summer at camp. The kids LOVED the book! It was such a hit! When the parents picked up,the kids had so much to tell them. The parents were very impressed by what their kids told them about the book and all the treasure tips they learned. The book is so full of adventure and the characters in the book are so relatable, the our kids felt that were a part of the book. They even acted some of the adventures and wanted to have a treasure hunt like the book! Your book inspired all the kids with its message and how entertaining it was. One day the kids even opted to shorten their pool time so that they could have more SALTWATER TAFFY time. As an added bonus, when they met you and also saw how "cool" your were, several said they now want to be a cool author like you. We are all TAFFY HEADS and are your biggest fans in Charlotte! Saltwater taffy is my most favorite book of all. I read it three times already. My sister stole it to read. I gonna get it back and read it again. I love Saltwater taffy.